McDonald's in Japan has launched a new ad campaign that centers around a caricature of a bumbling white foreigner who can't speak Japanese and, for whatever reason, happens to love McDonald's. Baka gaijin! 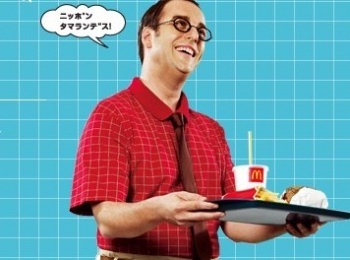 McDonald's in Japan is having a little fun with stereotypes of ignorant Caucasian foreigners with its newest ad campaign. The ads feature one Mr. James, a bespectacled white foreigner who dresses like your stereotypical IT nerd, with an ugly part, geeky shirt and tie and a consistently goofy smile. Mr. James speaks awful Japanese, and can only communicate in katakana, the system used in Japanese for transcribing foreign words. Mr. James is too stupid to know any kanji. He loves McDonald's food, and is traveling all over Japan to meet people and blog about his experiences in comically broken Japanese. According to some people, Mr. James is also a racist stereotype of white foreigners. Thus a non-profit called the Foreign Residents and Naturalized Citizens Association (FRANCA), has written an open letter to the McDonald's homebase in the US to shut down the ad campaign. Mr. James promotes ignorance, undoes progress made on behalf of foreigners for equal treatment in Japanese society and will be a burden on white people living in Japan, FRANCA says. It's an idea they argue should never have flown in the first place, asking "would McDonald's USA (or McDonald's in any other country, for that matter) choose to promote, for example, a new rice dish with a "ching-chong Chinaman" saying, "Me likee McFlied Lice!"? Of course not." I have no personal experience of what it's like to be white in Japan, but I have to say that it seems like a big fuss over a stupid joke. And here I was under the impression that foreigners were treated like gods in Japan. Anime has led me wrong yet again.